Lock in a great price for Hôtel Mirano – rated 8.9 by recent guests! They let us keep our bags safely before our check in time since our bus arrived well before 2 pm. We were even able to check in early! Were super helpful on which spots we could visit and would be interested in. Very clean, very friendly, good 70's deco in the lobby. Clean and well appointed. Friendly personnel. Quiet location with good street parking. This is a small proprietor run hotel and the comfort and décor are very nice. Breakfast was good and local neighbourhood was nice. Odd configuration with ground floor room which looked like it was for a disabled visitor. I was on a short trip in Biarritz. The accommodation was perfect for this purpose. The staff was very kind and helpful. Very friendly staff and very clean rooms. 10 minutes walk into town which isn’t too difficult. Very friendly helpful staff/owners. Good quiet location not far from town centre. Comfortable rooms and a good breakfast with excellent coffee. Very good value for money. Owners went out of their way to welcome us and help when our train home was cancelled. Highly recommended. The staff were so attentive and friendly. The walk to the Centre Ville was only 15 minutes, and taxi to the airport was 5 minutes. Great location. Immaculately clean rooms, comfortable beds. We travelled as a party of 6, so had 2 rooms, one upstairs, and one downstairs. Great value, there was nothing more we could have wished for. One of our best sellers in Biarritz! 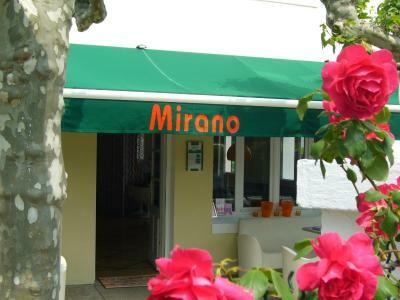 The Mirano is a 15-minute walk from Biarritz city center and the beach. It is 0.9 mi from the Biarritz-Anglet-Bayonne Airport and offers en-suite accommodations with free Wi-Fi. The air-conditioned rooms at the Mirano Hotel have a 1970s-inspired décor and are equipped with a TV and a work desk. Guests of this design hotel are invited to relax in the bar and the Mirano also features a shaded terrace. The Mirano is a 2-minute drive from Lake Marion and the A63/ E70 motorway is 3.1 mi away. When would you like to stay at Hôtel Mirano? This room features a flat-screen TV and a private bathroom with free toiletries, hairdryer and shower. Decorated in the 70's style, this room is equipped with a double bed and bunk beds in a separate room. This room features an entrance with dressing-room. Its bathroom is flooded with daylight. House Rules Hôtel Mirano takes special requests – add in the next step! Hôtel Mirano accepts these cards and reserves the right to temporarily hold an amount prior to arrival. The reception is open everyday from 08:00 to 21:00. If you plan to arrive outside of these times, please contact the hotel. Contact details can be found on the booking confirmation. Very nice owners. Quite. We did enjoy our stay. No mini bar or beer; no fault of the Hotel; I should have said. Perfect apart from no bars nearby. Quirky and bright decor. Very clean with excellent small touches. Staff friendly and helpful. Would stay there again. Safe box in room. More space for luggage. Better parking facilities. A little bit far from central. But because of ring services, it was not a problem. The hotel was good. It was clean etc. There was nothing to report in this section! Attentive, very friendly and professional staff/ owners. Lovely and very clean. Bit pricey; would still definitely recommend.